Seminyak is the go-to holiday destination on the island of Bali, so well liked by travellers due to the amazing restaurants of all calibre to choose from; fantastic boutique shopping opportunities, the array of day spas, beach clubs, the wonderful Seminyak Beach, friendly locals, amazing cafes (incl. 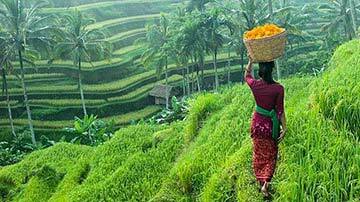 vegan & organic) as well as the enormous variety of luxurious Bali Villas. 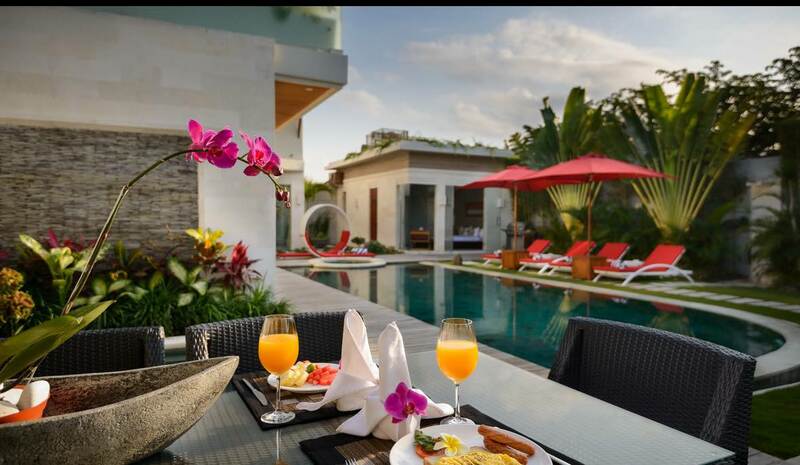 Our 3 bedroom Seminyak villas all vary in size with an array of modern amenities & wonderful service you receive from the attentive villa staff, your holiday in Bali is going to be memorable. They are perfect for a family with several children as well as groups of friends travelling together wanting to be in the buzz & excitement that only Seminyak offers. There are plenty of family & child-friendly amenities; from swimming pools designed for youngsters, pool fences to nanny services, baby sitters, high chairs and cots. Most of our 3-bedroom villas are just a leisurely stroll from Seminyak Beach, “Eat Street” (Jalan Oberoi) and fantastic beach clubs such as Ku De Ta, Potato Head, the famous WooBar (at the W Hotel), Mrs Sippy & the newly built Tropicola. 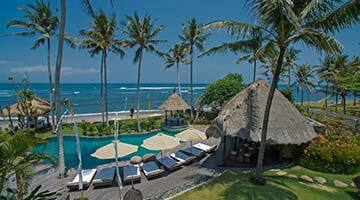 You will love the convenience of Seminyak as there are a host of tourist attractions for the whole family. Mum will love the idea of heading off to a day spa or a spot of shopping, the kids a few surf lessons and dad just relaxing by the pool catching up on some holiday reading. The area has so much to offer for a family holiday & with so many affordable 3 bedroom villas to rent, it’s no surprise why so many Australian families are flocking to Seminyak, Bali for their much loved ‘annual family holiday’. Also read: Where to stay in Seminyak – Oberoi, Petitenget, Double Six or Dhyana Pura? 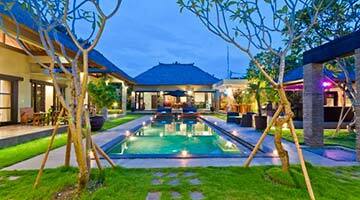 Following are our 10 best 3 bedroom Seminyak villas to rent. We have loads more but this should give you just a taste of what’s on offer. To view other 3 bedroom Seminyak villas or more Bali villas perfect for a family escape please browse this website or contact our reservation team. 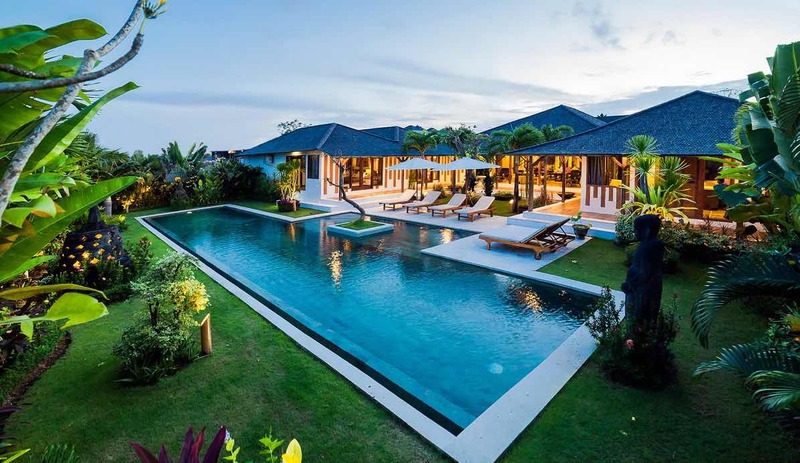 We just couldn’t leave this stunning 3 bedroom Seminyak villa off the list, Villa Adasa is something special and is a perfect representation of deluxe, tropical holiday accommodation. The villa is located just next to Sea Circus Café and just across the road from Petitenget Beach and the iconic La Luciola, beachfront restaurant. The villas 3 bedrooms will comfortably sleep up to 6 guests, all rooms boast King size beds with the Master suite along with its terrazzo soaking tub are on the top floor with its own private balcony. The outdoors with a private pool and open-sided living pavilion seem to blend in to one. Here everything is bespoke and chic from the dainty white parasols shading stylish recliners to the comfy rattan chairs at the dining table and the comforts of the twin styled, poolside gazebo. 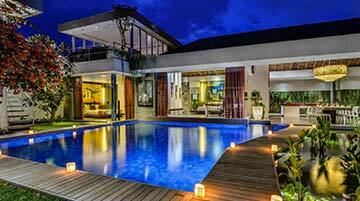 For the price, central Seminyak location & facilities this is the perfect family holiday villa. 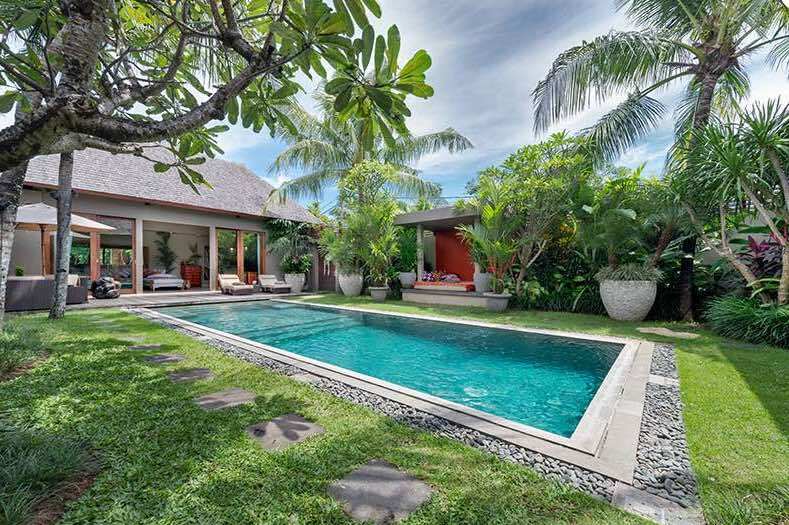 Villa Siki is holiday luxury in the heart of vibrant Seminyak, located in a quiet lane and only a 5 min walk to the entrance of Ku De Ta Beach Club, this location will have your friends back home green with envy. Guests can easily explore the Petitenget strip taking in hot spots like Potato Head, The Kiln, Mrs Sippy and Motel Mexicola. There are many family friendly restaurants around the villa so taking the kids out for a meal will be really easy. The villas 3 bedrooms display class and sophistication with the presence of fine antique furnishings, rich timber floors and everyone is a King at Villa Siki, with King size beds in each of the three rooms. The outdoors are equally if not more so impressive than the interiors, a private 12 meter pool and a huge timber poolside deck down each side. Tall coconut palms sway in the sea breezes as you choose a sun lounge for the day, ask your private chef to whip you up a seafood BBQ lunch or dinner accompanied by a refreshingly chilled chardonnay. As soon as you walk through the gates of Villa Eshara you will know you have made the best choice for the family. A gorgeous natural stone swimming pool with a shallow end for the kids is flanked by ergonomic day beds, white market umbrellas, soaring palms and beautiful tropical plants; the recipe for pure holiday relaxation. 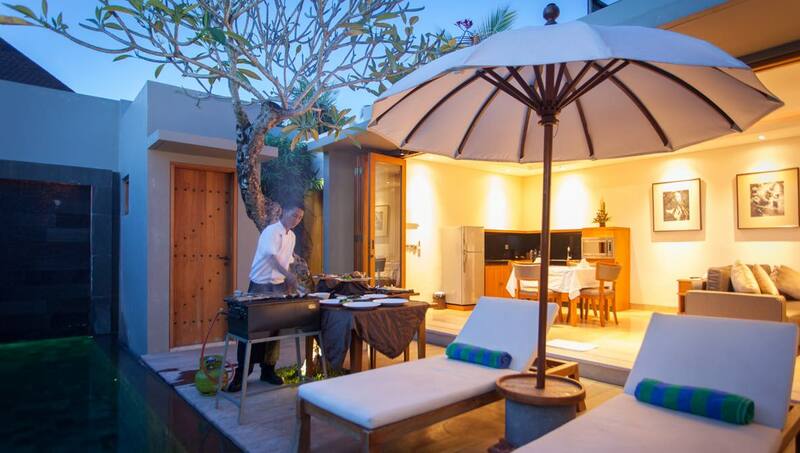 The villa is fully staffed and the outdoor Australian styled BBQ will no doubt come in handy, ask the staff to do the grocery shopping for you or take a 5 min walk to Seminyak Square with ATM’s, a great liquor store ( where they stock Australian wines) and all your shopping needs. The interiors are exquisite, a series of hand-picked furnishings with the taste and touch of an interior designer seems to have waved a magic wand. The dining table is out of this world, with fur skin covered, high back chairs and a dramatic chandelier to illuminate in the evenings. The private en-suite bedrooms are a picture of sophistication, soak in the natural stone bath tub and relax in air-conditioned comfort. Two rooms boast King sized beds with the third room twin singles, easily converted to a king sized bed upon request. A unique opportunity presents at Villa Lataliana, normally a 6 or 7 bedroom villa which can also be rented as a 3 bedroom villa; guests have the luxury of a huge pool with spacious gardens, akin to that of a much larger holiday residence. Villa Lataliana is so convenient, just a 300 metre or so walk will bring you to Seminyak and Double Six Beach where you can chill out on a beach bean bag at La Plancha or live it up a little at Cocoon Beach club with its beachfront swimming pool and fine dining. For the kids there are lots of restaurants that run along side Double Six beach. The villas garden is just what you would expect a tropical garden to look like, only better. The villas free-form tropical pool seems to gently meander through the perfectly manicured, mature tropical gardens. There are a series of both open-air and enclosed living and accommodation pavilions. The media room is great for the kids with an enormous flat-screen TV, play-station, ping pong table, a snooker table and even a baby grand piano to bring out the musician in us all. 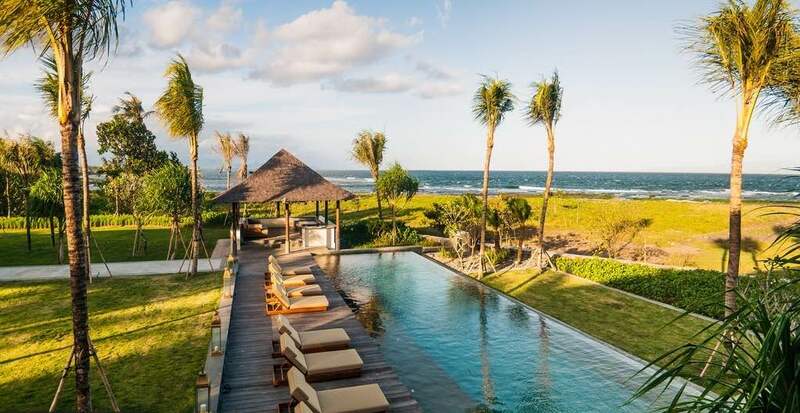 The Layar Villa is a 3-bedroom Seminyak sensational family villa & is located in a gated and private villa estate with exceptional 5-star services and amenities. The complex is basically one enormous tropical garden, beautifully manicured with a series of villas positioned throughout to offer plenty of privacy and above all a real sense of space compared to a traditional villa. Located just along Jalan Pangkung Sari, guests are only one street back from Jalan Oberoi, famous for its vast array of high end and mid ranged restaurants, cafes, chic boutiques and selection of Spa retreats. The beach is also an easy walk passed Motel Mexicola and La Luciola to Petitenget Beach. 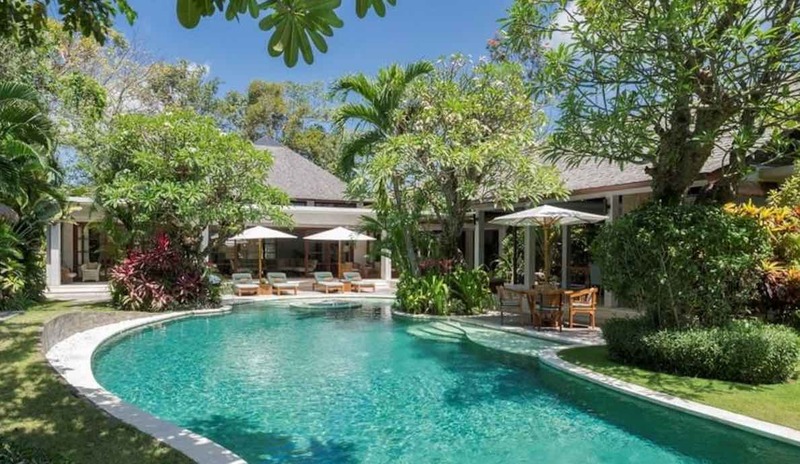 But it’s the outdoor setting that steals the show, the villas architecturally designed pointed roofs, an enormous private pool and bursting colors of bougainvillea, accompanied by fragrant scents of frangipani as you soak up the warm Bali sun. 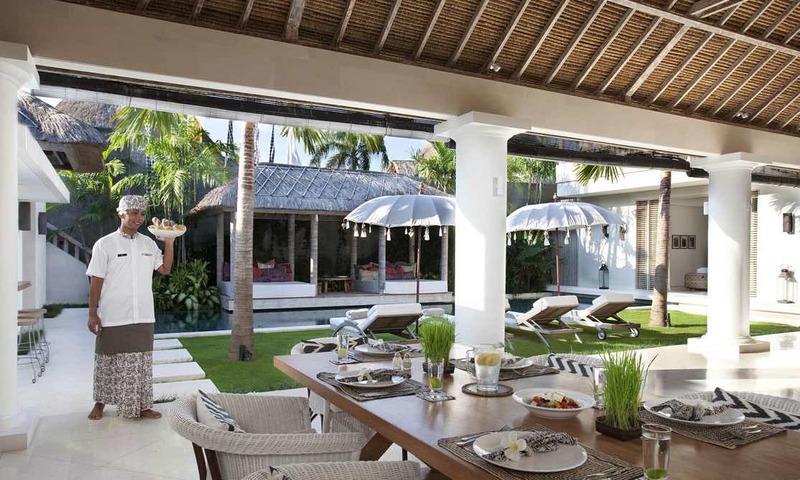 This is definitely the villa you want to rent if you want to impress the kids & have a Seminyak holiday unlike any other. Just have a look at the pool and imagine relaxing here with the family. 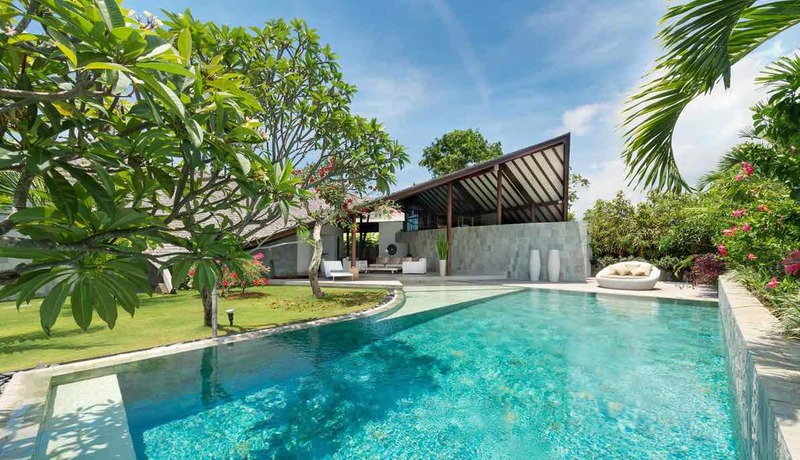 Villa Sahana is a fabulous family holiday villa in an equally fabulous position tucked in a quiet lane at the top end of happening Jalan Oberoi. The villa has a well sized private garden with plenty of manicured lawn space for the kids to play and of course swim in the private pool. The villas living areas are open-sided facing the expansive garden and pool; making this space feel much larger and unconfined. The kitchen has a great breakfast island bar and the state-of-the-art coffee machine will be popular in the mornings as your continental breakfasts are served. The bedrooms are spacious, clean and bright, furnished with king size beds and open-air en-suites with rain showers and twin vanities. In the garden a traditional Joglo building houses one of the bedrooms, offering a little more privacy and the coziness of natural teak timbers. Everything is within walking distance of the villas, convenience stores, ATM’s, day spas, great restaurants such as Ultimo and yes Ku De Ta, one of Bali’s most iconic beach clubs that you will love. Location, location, location……..yes it’s hard to find a better location than that of Villa Kalimaya. Discretely tucked away in a private lane just behind Seminyak Village Shopping Centre & Seminyak Square; you will have everything at your doorstep! Wander across the street to Sisterfields or Grocer & Grind for that morning coffee; collect all your groceries from Seminyak Square, take the street to Petitenget Beach, passed Motel Mexicola and Sea Circus. Maybe followed by lunch at La Luciola and an impressive dinner experience at the renowned Ku De Ta Beach Club. Fir the kids there is always the popular Hanks Pizza or Johnny Rockets or the Cornerhouse for some amazing burgers. The swimming pool has a section for toddlers while the parents can stretch out on plush, vibrant red sun recliners, or shelter from the sun with a good book in the poolside gazebo. The living areas can be fully enclosed to enjoy your preferred climate as you watch some Cable TV from the plush sofas and arm chairs. There are 3 bedroom suites spread over two levels, the antique King sized beds are so comfortable and one room has the option for twin single beds. KoenoKoeni Villa is a two storey luxury 3 bedroom Seminyak villa featuring contemporary design elements and sleeping up to 6 guests. 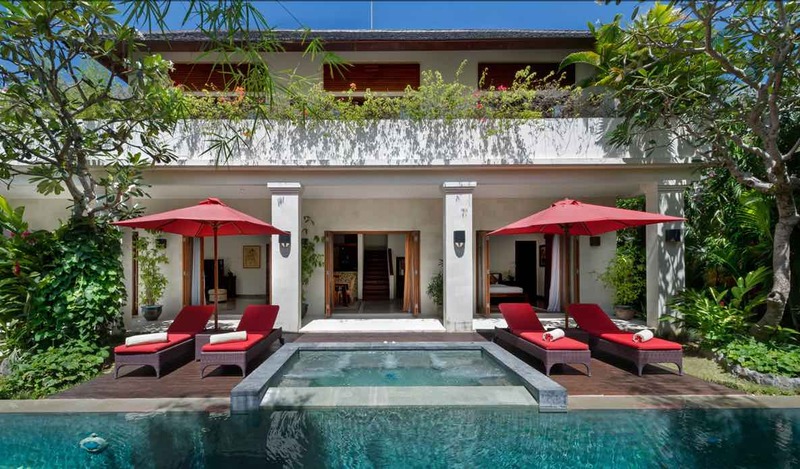 The villa is located just off Jalan Petitenget, a highly sought after Seminyak address. From this prime location guests can easily walk to some of Seminyak’s most popular tourist attractions such as Potato Head Beach Club and great restaurants like Bambu, Saigon Street and let your hair down at Mrs. Sippy or the Hu’u Bar in the evenings. If you ant to take the kids for a great meal head down to Sisterfields or Boss Man for a great burger & fries. You will be graced by service from the friendly staff who will take care of any additional requests, maybe a nanny for the evening, a pool safety fence, in-house massages, car rental and day tour bookings to name a few of the services available. The living areas have all your entertainment needs taken care of, kick back on the comfy sofas, watch a DVD or Satellite channels, turn the volume up on the Bose Sound System or make use of the iPod docking station and there is Wi-Fi throughout the villa. Located just one street back from Seminyak’s famous Eat Street, Jalan Oberoi, Villa Miro is a large sized 3 bedroom holiday residence spread out over two levels. The villa is almost brand new and offers a chic tropical living experience combined with all the latest amenities. The villas striking white façade gives that immediate beach side sensation and within a 10 min walk you can be on the sand right in front of Ku De Ta Beach Club, arguably the islands best! The villa boasts a large swimming pool with an abundance of sun lounges and an ultra-chic day bed that has to be seen to be believed. There is a wading pool for young children as well as a built-in jaccuzzi and an array of outdoor sitting areas for al-fresco dining or just relaxation. The Master suite boasts a private lounge area while all rooms comprise king size beds, floor-to-ceiling glass windows providing great views and soaking tubs in each of the private en-suites. 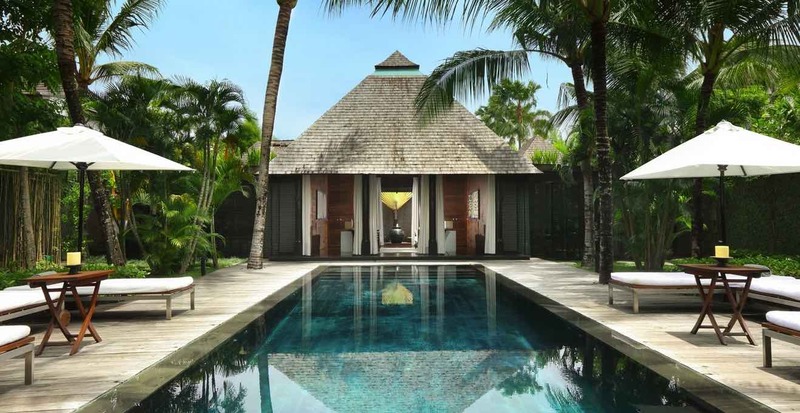 This 3-bedroom Seminyak villa will have guests in awe at the sheer size and space both indoors and out, not to mention its beautiful design and traditional elements such as its shingled roof. Three bedrooms comfortably sleep up to 6 guests. The villa is located along Jalan Mertanadi on the border of Seminyak which will only take a 5min scooter or taxi ride to the Seminyak and Double Six beaches. Nearby is Sunset Point for all your grocery shopping, wine & spirits and ATM’s. Jalan Mertanadi has seen a huge face lift over the past few years with trendy cafes like Elgin Street and Ingka Café. A must try is Naughty Nuri’s made famous for their secret rib sauce and also within walking distance is Mama San, another must try dining experience. The villa boasts a beautiful T-shaped swimming pool and a mature tropical garden bursting with tropical colors and scents. The villa boasts every modern amenity with a fusion of rustic timber furnishings and a double heighted main living pavilion with an entertainment mezzanine floor.